Today’s rapidly changing society can make children feel insecure. God uses their family and friends to help them develop a sense of belonging, and Club is a place to make friends. Club also provides opportunities for girls and boys to develop skills, experience successes and failures, make choices based on biblical principles, and also to have fun. PURPOSE: The mission of Pioneer Clubs is to help children put Jesus Christ in every aspect of their lives by recognizing Him as Savior and Lord and developing a lifestyle based on biblical values. GOALS: To enable children to enter into a personal relationship with Jesus Christ and to know His Word; To enable children to form healthy relationships; To enable children to grow as whole persons; To enable adult leaders and helpers to understand children and help them develop. BELIEFS: Jesus Christ, the son of God, died and rose again to provide redemption for sinners; The Bible is the inspired, authoritative Word of God and is our rule for faith and practice; God has created His people as whole beings called to live a biblical lifestyle; and God has ordained the Church to evangelize and to nurture through discipleship. Pioneer Clubs further believes that God created each person with individuality, uniqueness, dignity, and potential; Children develop a sense a personal identity and character by comparing and contrasting themselves with both male and female adults; Children learn Christian behaviors and biblical values as modeled by their adult leaders; Values are formed when children choose among alternatives and consider the consequences of each alternative. SPONSORSHIP: Calvary Baptist Church is delighted to sponsor this Bible based weekly program. 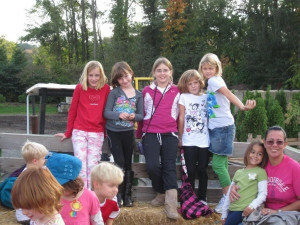 Girls in Preschool through the 7th Grade meet on Tuesdays, from 4:00pm to 5:30pm. Since our Club has increased so much in numbers, we have had to make some changes of scheduling during the weekly meetings. This year upon arrival, the girls will be given a small snack. We will then hold a short “Opening” for the whole Club, where we will take attendance, state our Club Verse, Club Motto, and sing our Club Song. The Scooters and Voyagers will then separate from the Pathfinders and Trailblazers. Participation in earning Activity Badges and playing games will be done in these groupings. Then Exploration Time, where Bible Badges are earned as the Handbook work is completed, will be held in the age appropriate classes. We will continue to all come together for our Closing Circle. Awards will be presented at the end of the year in a very special program to honor the girls for all their hard work. Throughout the year, many special events are planned. Where and When do the club meetings take place? Pioneer Girls club meetings are scheduled during the school year on Tuesdays at 4:00 P.M. to 5:30 P.M.
We would be so happy to welcome your daughter into Pioneer Girls.